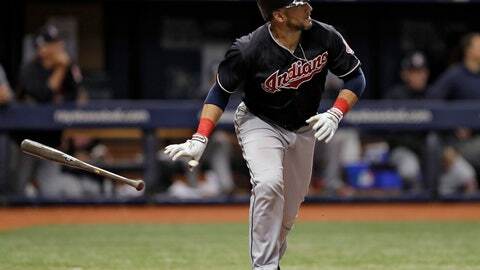 CLEVELAND (AP) — Indians All-Star catcher Yan Gomes said he’ll “absolutely” play Game 1 of Cleveland’s AL Division Series against Houston despite cutting his right thumb last weekend. Gomes got hurt when he accidentally connected with the bat of Royals outfielder Alex Gordon while trying to throw out a runner Saturday in Kansas City. Gomes received two stitches, and there was doubt whether he would be ready to begin the postseason with the AL Central champions. Gomes initially thought he had broken his thumb but said his finger feels much better. He planned to take some batting practice Tuesday as the Indians prepared to face the defending World Series champions in Game 1 on Friday. Manager Terry Francona said Gomes is “doing really well” but he would keep him out of Tuesday’s intrasquad game just in case. Gomes has had one of his most consistent seasons, batting .266 with 16 homers and 48 RBIs.